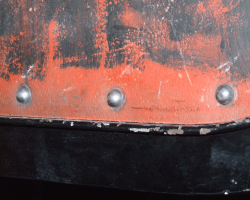 After a few months of being loosely bolted into place, the right hand cab sidesheet is riveted there. The left hand one has been marked out as it is necessary to drill new holes in the new metal behind it, and will be riveted next week. 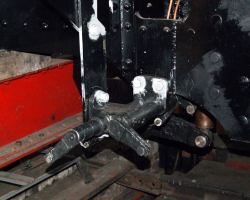 The permanent fixing of the cab side has allowed other items to be fitted, including the damper control gear and, below, the relays to the damper doors once the boiler is back in the frames. 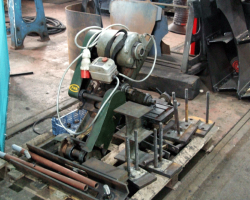 The ex-KESR horn grinder is currently off the engine while some modification is made to improve its stability, but is seen here in more detail.